I was sitting here at my computer one day working on my 60s site, when my mind wandered back to a time when I was a sophomore or junior in high school in Circleville, Ohio. I was thinking about the haunted bridge near a place called Yellowbud close to Williamsport, Ohio. There was nothing unique about Yellowbud except it sat off on a state highway to Chillicothe. It was a typical farming town. Many of us used its back roads and easy access to park and neck. So when asked what college are you planning to attend we would jokingly say Yellowbud Tech. Of course no school by that name ever existed. That line got so famous that T-shirts were made with a Yellowbud Tech logo. I really don't know how they spread, but rumors started like wildfire that the bridge was haunted. Many kids and some adults claimed that they had seen ghosts of a man and woman from the 1800s hanging around the bridge. (I had been there a couple of times and hadn't seen anything but my imagination sure went round with the sounds of the night) Folks claimed that a woman and man who had lived nearby died under suspicious circumstances back in the 1800s and were trying to find their home which had long since been torn down. It was the talk at school whic resulted in the traffic to the bridge increasing tenfold as everybody wanted to see the ghosts. As the story continued to grow and be stretched beyond believability, so did the volume of people visiting the site. Now there was no privacy for your parking, necking and beer drinking. Everybody was stumbling over each other. This place was becoming a tourist attraction! I never saw the ghosts and I had been there. Did they exist? I don't know. There were plenty of credible people who saw them. What I do know is the bridge is no longer there as this one many like them disappeared over the years. It was just too costly to keep them maintained. 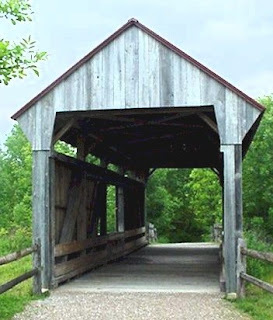 One thing is for certain the covered bridges themselves were ghosts of our pasts. It's funny how you remember these insignificant events of our lives. Man what fun we had back in the 60s. Wouldn't you like to re-visit that time for just one more day? For some more fun, revisit the 60s. What To Do with Those Out of Print Vinyl Records?